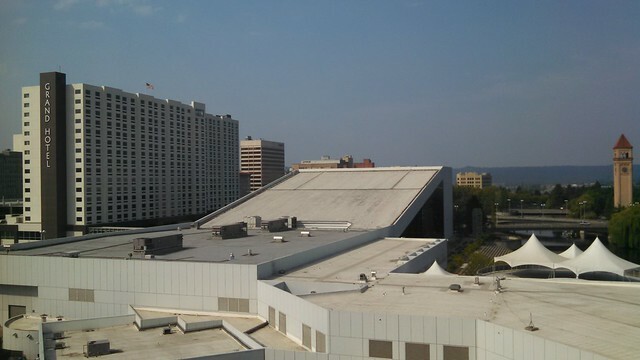 Today was our final morning in Spokane. After breakfast, we packed out of the room and left for the first stage of our four-day/three-night trip back to Fernley. In contrast to the Mordor-like gloom that blanketed the city a few days ago, today the sky was (relatively) clear looking out from our ninth-floor room. 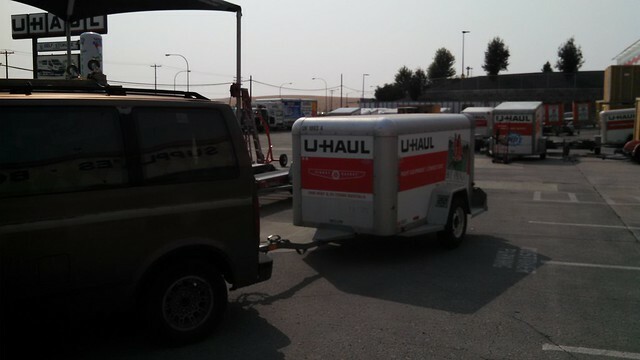 We set out eastbound on I-90, made a fuel stop just over the border near Coeur d'Alene, and turned south on US-95 for Moscow, where a U-Haul trailer reservation awaited. 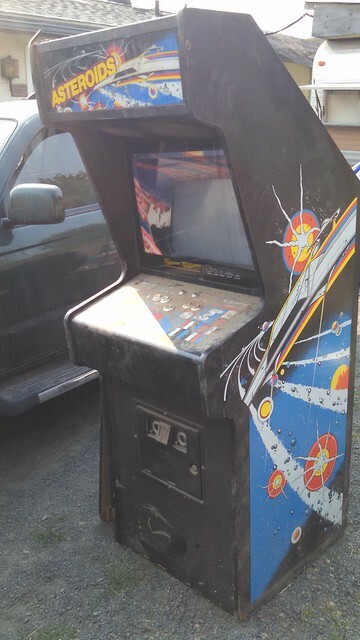 As I explained a few days ago, Lisa's friend from her days in Los Alamos NM has been holding on to Lisa's Asteroids arcade video game for years now, and when we visited on the way to Spokane, she told Lisa that Lisa could have the game back if she could haul it away. Accordingly, we redid travel plans, lengthened our trip home, and reserved a U-Haul from Moscow ID. South of Coeur d'Alene, we had a vehicle malfunction. The tilt-wheel mechanism on the Astro broke. This means the steering wheel won't stay in any given position. It wobbles up and down as we drive. Lisa attempted to improvise a solution to lock it into a single position, it wouldn't hold satisfactorily. This means another trip down to my Bay Area mechanic for a steering column replacement or repair. As it stands, it makes the vehicle more difficult to drive. Inasmuch as I was terribly tired, Lisa drove most of today, starting just south of Coeur d'Alene. Here we are shortly after picking up the trailer. Considering that students are moving back into town for the start of the school year at the University, I wonder if U-Haul should be paying us to equalize their equipment for them. As it is, the trailer rental cost for four days is trivial compared to paying the insurance on the move. We drove up to Lisa's friend's house, and Lisa and I wrestled the console out of the garage. Here it stands, freed from its dusty prison in the garage. 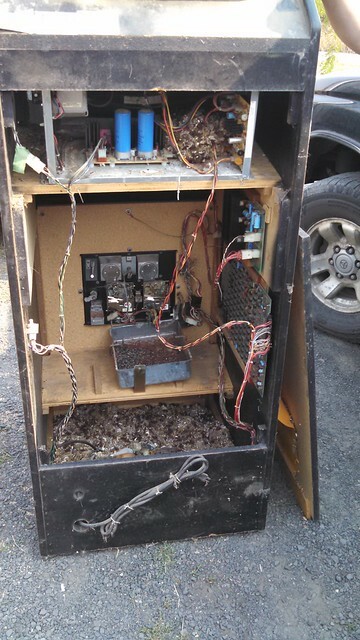 Lisa removed the rear panel, and found the bad news. 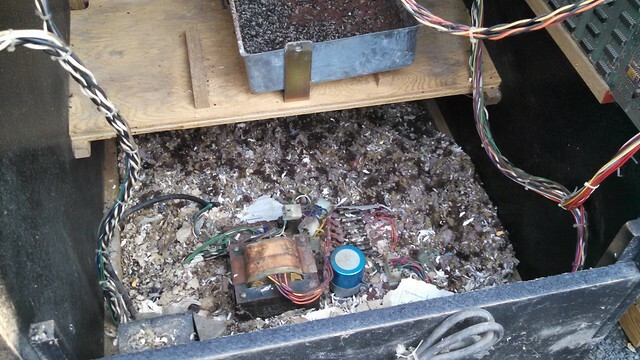 Mice have indeed been living inside the machine, probably for years. It's not a pretty sight. They chewed up the instruction manual (including Lisa's and her friend's customization documentation) and part of the cardboard surrounding the screen. 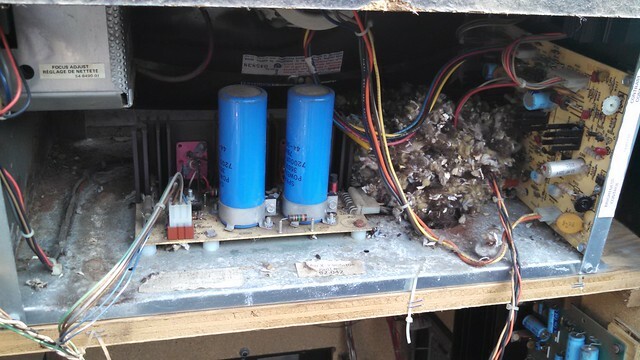 Lisa's friend got out the Shop-Vac and donned a dust mask, then vacuumed out the mess. They looked things over. Lisa still thinks the machine can be restored, but it will surely take many months. Lisa and I wrestled the console into the U-Haul. We then took some things out of the back of the minivan (mostly the speakers from the Match Game SF tech kit) and stored them with the console. With moving blankets rented from U-Haul, she worked to get the load balanced and packed properly. With the game console secure (and the now-loaded U-Haul trailer riding somewhat better), we once again turned south. We stopped at Moscow one more time to pick up some groceries including lunchmeat to go with the loaf of bread we'd carried with us all the way from Fernley without actually using. An hour or so later, we were in Lewiston and the Holiday Inn Express. To our great relief, we found that they have designated long vehicle/trailer parking, which was very convenient. Even better, I hit the jackpot with a room upgrade. We were upgraded to a small board room, similar to our trip through Chicago for last year's NASFiC. 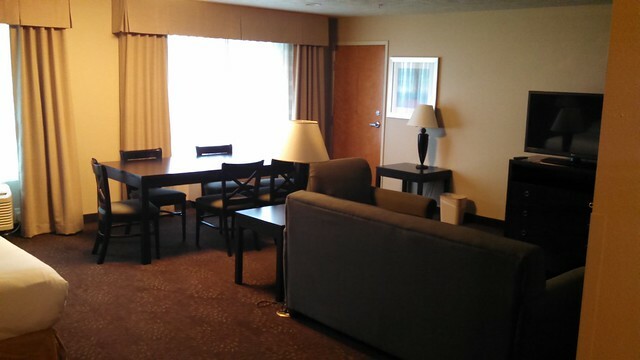 However, unlike the Chicago room, which had an unfriendly-to-the feet hardwood floor, this is more like a standard hotel room with a big living room and a boardroom-like table in the living area. 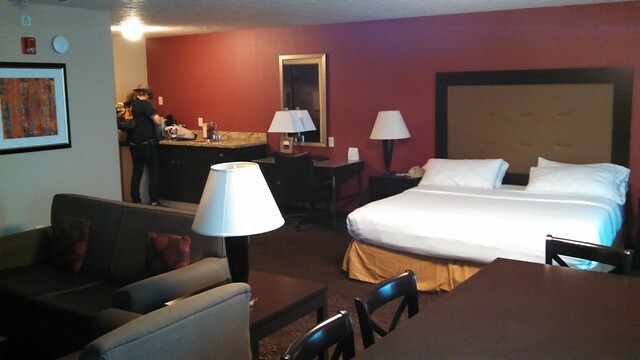 I wish we could have had a room like this in Spokane. 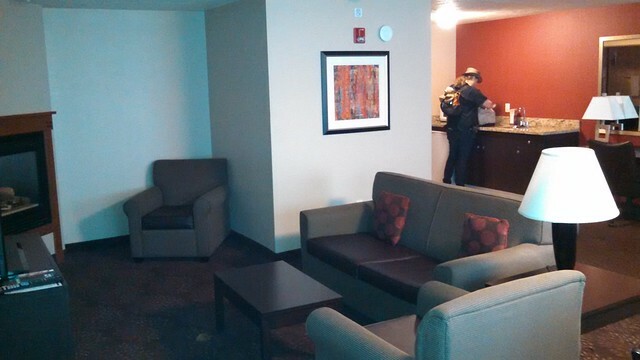 Especially if we could have had the connecting second bedroom, I think we would have hosted a private party meet-and-greet for people at least one night of Sasquan. Of course, the only reason we get upgrades like this is that we're staying for just one night and it's cheap to upgrade a Platinum member into a room they weren't ever going to rent anyway, freeing up a standard room for someone who might walk in at the last minute. We had a minor misadventure moving in to the room, which resulted in breaking one of the CFL bulbs on Lisa's bedside lamp. This delayed our move-in while the hotel folks came and cleaned and vacuumed the toxic mess up. Lisa spread a spare sheet from the room's linen supply over the area in case there are any shards missed by the vacuum cleaner. While moving our stuff in from the minivan, Lisa spotted a tourist pamphlet for travelswithkuma. 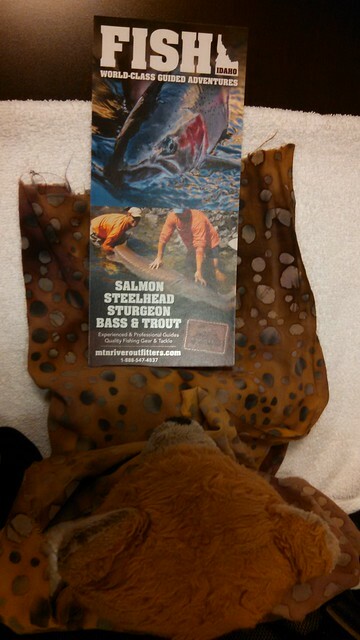 Kuma Bear seems fascinated with this pamphlet about fishing opportunities in Idaho. We used up the rest of our loaf of bread and the groceries from Moscow and spread out over our huge hotel room, taking it as easy as possible tonight. We have not traveled very far today. Tomorrow's goal is Ontario, Oregon. If you look on the map, you may not think that terribly ambitious. However, we're now pulling a trailer over the hill-and-dale US 95 through northern Idaho, and that's going to slow us down. Furthermore, we're still very tired. I am not really looking forward to these next few driving segments.